You are invited to attend a Fundraising Reception for the Bow Valley Women’s Emergency Shelter sponsored by the Calgary & District Labour Council! Special Guest: The Honourable Kathleen Ganley, Minister of Justice and Aboriginal Affairs. Tickets: $80. 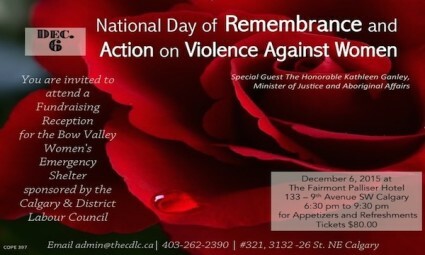 For tickets please contact the CDLC at admin@thecdlc.ca or via telephone at 403-262-2390.